I just returned from two wonderful weeks in Hawaii. It was 14 days filled with family, new friends (including my hostess who happens to be Don Ho’s daughter! ), and lots of sunshine. It was the first real vacation I’ve taken in years. Sure, I’ve taken many weekend trips here and there and a European adventure three years ago, but these were all filled with places to visit. In Hawaii, I was on island time and adventuring with my sons, daughter-in-law, and granddaughters. It was blissful and relaxing, and I learned or confirmed some things about myself. 1. I crave schedules! Clients who work with me know how I feel about schedules. They bring order and purpose to our lives and often show people that they have far too much free time on their hands. I lived for a few days without a written schedule, but I felt purposeless and drifting. To balance my vacation and my need for purpose, I created a very simple schedule each evening to execute the following day. That schedule included social media posts, client communications, and business brainstorming time. It helped me feel accomplished. That’s what I needed. If you can vacation without a schedule, then good for you! I need a schedule. 2. I REALLY miss my family! I’ve never lived near my granddaughters, as they are military brats, but being in beautiful, laid back Hawaii with all my family, playing games, sharing meals, and having fun made me realize just how much I need them. No, I am not planning to move there (I don’t think), but I am putting everything on my Delta SkyMiles card. Hoping for a free flight next time! 3. Comb and go is THE way to go! As you can see in my photo, I was completely carefree with my hair. I think I blew my hair dry twice in two weeks. I’ve decided to shun my dryer and flat iron a few times a week and embrace the waves. It will make it much easier to get to early morning appointments! 4. I’m OVER long haul flights! In this age of airlines cramming people in and with few of us having access to first-class seats, I am going to visit friends in LA going and coming next time, especially if I can score a free flight. I’ll just book two different round trip flights, one from the east coast to the west and back and another from LA to Honolulu and back. Lots of benefits in doing this including seeing great friends and having shorter flights. 5. I need to take more beach walks and more hikes! I have lived less than 2 miles from the Chesapeake Bay for over 29 years, and rarely do I give myself permission to take long walks on its beaches. I’ve done much better in the last six months, but after strolling the beaches of Kailua these past weeks, I realize what a healthy practice beach walking is. Stress levels plummet, and clarity on certain matters can be reached. 6. Detachment from my usual routine helped me gain clarity regarding some personal and business matters. I won’t elaborate here, but I think you may agree that going away and just “being” for a while helps you reach certain decisions. I’m working on these now. 7. Enjoy the journey while staying focused on the goal. I know this, and I actually do this pretty well, but hiking up Diamond Head at noon really tested me. Hot? Yes. Crowded? Oh, yeah. Daunting places for this gal who recently took a nasty fall? Definitely. I didn’t push myself as you usually do on hikes. I took regular stops and marveled at the crater, taking pictures of it and stopping for a few water breaks here and there. I treasured chatting with my patient son who hiked with me. 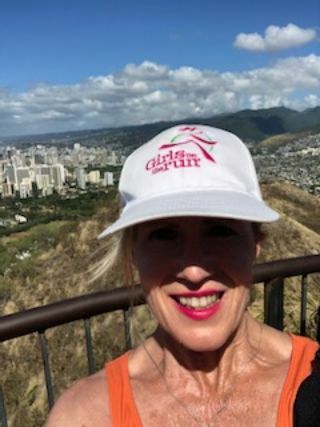 And after lingering at the very crowded top of the crater, overlooking Waikiki, I took my time coming down and met some really nice folks with whom I chatted. My goal was the top, but I enjoyed the journey up and back. We should all stop and smell the roses as we pursue our goals! Need to learn a few lessons about yourself or to have something confirmed in your life? Get away! Even if it’s for a long weekend, just go! Walk, explore, journal, read, think. When we are immersed in our work and our routines, it’s hard to achieve clarity. Being in a different environment helps us to be more open to what our heart and instincts are telling us. If your budget is an issue, think outside the box. There are many great and affordable listings on Air BnB. I DO recommend staying at places hosted by what’s called a Superhost. These folks have many verified reviews. Ask a friend who has a vacation home if you can stay there a few days at a low or no cost. Where there’s a will, there’s a way. Winter is a great time to get away. We do some of our best inner work during the hibernation months of winter. Plus, prices at hotels and rentals are usually better, depending on where you go. Go for it, my friend! Take off, and learn a few things about yourself. In fact, I’d love for you to drop me a line about your adventure. Email me at amywaltoncoaching@gmail.com, and tell me where you went and what you learned about yourself. Yes, I Made it Up Diamond Head, and I Enjoyed My Journey! Amy Walton is an author, speaker, and certified life coach who currently lives in coastal Virginia. She brought the aloha spirit home with her after two weeks in Hawaii, and she’s already planning her next trip! In the meantime, she continues to empower women in midlife and beyond to live the second half of life with joy, passion, and purpose. Connect with her at amywaltoncoaching@gmail.com.